I want to get the stove working in the tent. Here is the unit. I screwed together 3 pieces of pipe I have an elbow and I need to fashion a stove jack for the tent. A safe platform it will need too. First I'm going to hit you with the stove questions. I appreciate our members input. Usually. 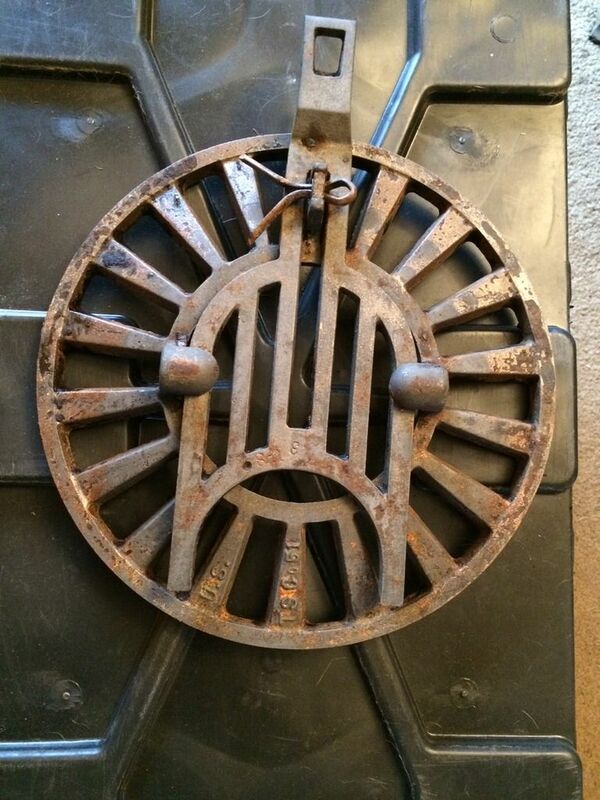 I'm going to burn wood so I figure I need some sort of grate to go on the inner diameter of the center piece of the stove. This is assembled. I sure dont want my fire burning on the bottom. I'm figuring I fill the bottom with about an inch of sand, put a fairly fine grate in it, keep fire off floor, get a damper for the pipe. Here are the numbers off the front. I got to 4x6 rugs. That will make a 8x6 floor for a 9x7 tent. The white roll is what I;m thinking about sewing into the tent as a stove jack. We'll get to that later. I hope to set the tent up this weekend and wiggle the stove around in it some to try and see where I want to place the jack. Are you figuring on putting the jack in the wall or the roof? Fiberglass jack? I'm thinking it going to have to go through the roof. (I have a nifty idea in mind) Sides are too low, front and rear are flaps. I can find few pictures of these with stoves in them. We are a few steps from the stove jack wolfy. I have the grate that belongs in there. it keeps the fire up 8" or so off the bottom. The ashes fall through into the lower portion. My stove bottom rotted out. The top isn't much better. I can send it to you if you want it. It's heavy and in good shape because it's been inside. Keep the fire small, that will be a lot of stove. It looks like it will be awesome. On the other hand.........I broke out the battery operated fan for a trip this weekend. You are right xj. Plenty of stove. That's why I think a damper will be important. A cool grate would be a good thing. Cool progress so far with the stove, and glad a grate became available. I'm struggling with the idea of cutting a hole in the roof, mainly because I spent so much time in those tents with our Scout kids, and knowing how scarce they're becoming. It seems you could fashion a larger short section to sleeve the stovepipe and run it out the side flaps. You never know what the future may hold for that tent and what you could possibly want to do with it. I suppose I'm just playing the devil's advocate. Two or three pavers will keep the bottom off the deck you built, so that's no biggie. I'm guessing the idea is mainly to have a heat source as you sit in the tent, seems like you didn't have overnight plans for it. I can't remember on that one. But as the weather warms enough to not need the stove, but still have the tent up, are you going to have to cover the hole from the stove jack? Don't mean to sound negative by any means at all....just thinking out loud I guess. Looking forward to seeing what you come up with and how well you like that stove!! I'm with you Dano. I'd hate to see it cut. The stack should come out between the doors at the center of the peak. Well, I wouldn't bore a 4" hole through that tree. Hmmm,,. Do you think a piece of cement board and some basic framing would be a good way to run the pipe out the back? I like where you're going with this, Creek, but honestly if it were me, I'd use one of these. Don't have to compromise the integrity of the tent, no mess/ashes to clean up, wood to cut/haul, etc. I'm pretty lazy and this seems in keeping with the KISS principle. Yeah, I have to agree with nuke......much easier to control the heat and no worries about having to compromise the integrity of the tent with the propane. That old G.I. stove definitely has a cool factor and I understand the desire for a traditional wood burning stove, but the disadvantages outweigh the advantages IMHO. Relax guys, I haven't cut the tent yet. I won't hesitate to do it if I take the notion though. My goal is the most relaxing atmosphere as possible. A wood fire is choice number 1 for me. Being as I have everything I need for that, That's the set course. Looks like the Milsurp diesel drip heater? I gonna guess this is more for sitting around and enjoying the outdoors than staying in over night? My wall tent was 12X 13...and a 3 Dog Stove was a little much. Problem is that it it gets too hot or about the time it gets comfortable....It's ready to go out. We used charcoal for over night,.... dampened down. That stove is missing the grate, for sure.... suggest a fairly heavy grate as thin grates burn thru quickly..added one in my box stove, in the garage...made from 1/4 key stock....this one now is 3/8in. Sand in bottom good,... fire brick better... hard to find thin and round(curved) brick. My stove jack was in the roof....think the panel for cutout is Nomex. Had a panel like this and has a cover...works very well.....used it for 10 years of Rondy and outfitters camp tent. Near bottom of the page......From Spring Valley Lodges....they have made several of my tents. My newer wall tent is only 8X10 ....so have gone to a Mr Heater as well. I believe that is the older M-1941 not the newer H-45. i used a Mr. Heater in my duck blind for years. They work pretty well but have zero ambiance and ain't worth spit for toasting marshmallows. Cutting a hole for a jack isn't going to ruin the tent, at least in my opinion. I just think that it's a pretty large wood stove with a shape that's going to take up a lot of space in a tent that size.......and they do make a Mr. Heater-type propane unit that swivels for cooking eggs, bacon AND marshmallows! This stove isn't much bigger than a grill tank. Bout the same height, stove is 16 wide, tank is 12. I'm not asking for advice on choosing a stove. This is whats going to be the tent heater. I want to insure I don't miss something stupid as I move forward. I'm going to burn a fire in it this weekend with it vented through the flaps. We'll go from there. If I do decide to vent through the canvas, I will cut this tent without reservation so be ready for it if I do so. I'm not committed however and I may find venting through the flaps is doable. I can't wait to sit down there by that warm stove with a cold beer. I thought it looked bigger than that in the earlier pictures. That white liner might allow for the flaps to drape around the pipe that goes through the flaps. I think it's rated @ 800 degrees and I have 24 inches of it to wrap it with. Might be a thought. Creek, I gotta apologize for starting the derail on this. I think your heater idea is awesome and I can certainly see why you folks would want one. You have a great view and nothing would be better than sitting there with a coffee, watching the rain come down or the fog blow out, and having a heater to knock the chill off. I think it's a great idea!! I also need to shut my mouth when it comes to things like this. Cutting a hole in the top keeps with tradition of most wood stoves and dadgummit, it's YOUR tent!! I'm still looking forward to seeing what you come up with, REGARDLESS of how you do it!! Thanks Dan. On we go. Another issue was finding a damper for the 4 inch pipe. We have a Ferguson Supply, Airco, Lowes, a private home center, and a true value and no one had one. I ordered one off ebay that will be here after the test flight. The devil is always in the details. I need a cap for the pipe too. If you put ssnd in the bottom how will you get the ash out? Sand is cheap...just add new sand.......? Well. I did find the grate. I also found a wood chuck moved into my shed. Big hole along one wall and he buried a bunch of tools and parts that were on the floor. I like wood chucks, like little bears. Might have to shoot this one though. So a Little rusty. I will give it an evapo rust soak, or vinegar. It is very thick steel and it still works fine. Do you have the tool? 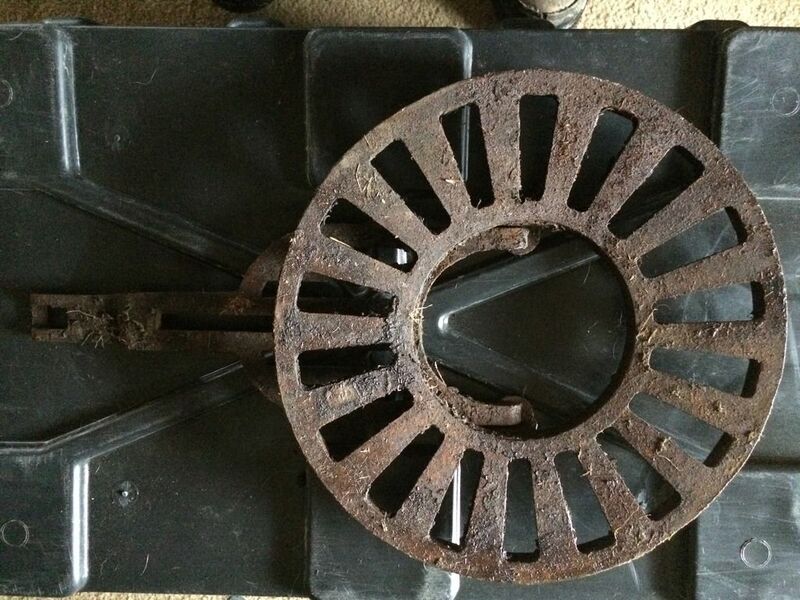 There was a rod that hooks into this to open and close or shake the grate. I'll send it out Monday and add the milk weeds stuff too. That is a neat grille for that stove. I was cleaning our stove out this morning. 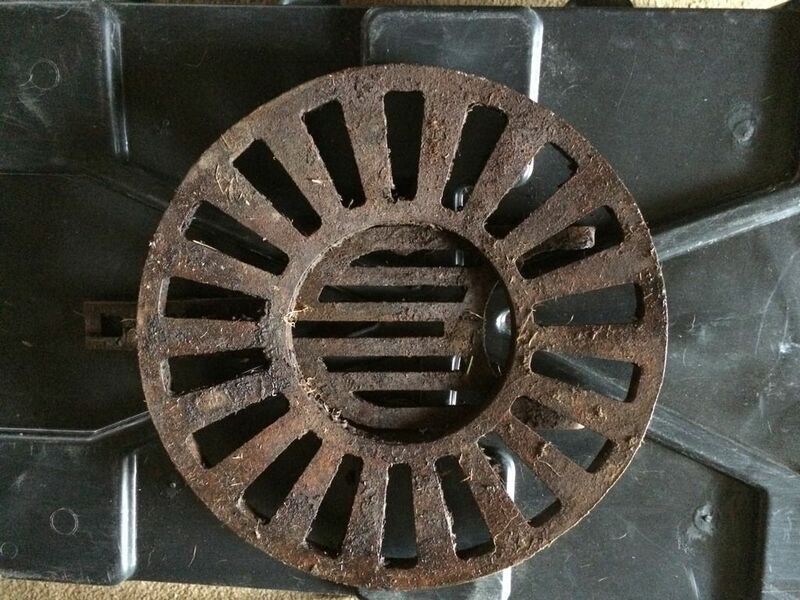 It has an ash pan underneath the grate and a separate door to get to it. Could you put a metal pan pan on the sand so most of the ash that goes through the grate can be just lifted out? The right size frying pan with the handle cut off would work. An old dutch oven with no lid too. Just a thought. You are the man xj! Thank you. I have no other tools but that's ok. I made a bandaid for it today. I'll post shortly. I got some things done today. I had to go to Lowes. I got a 16 x 16 paver for the stove to sit on. 4 bux wasn't too bad. 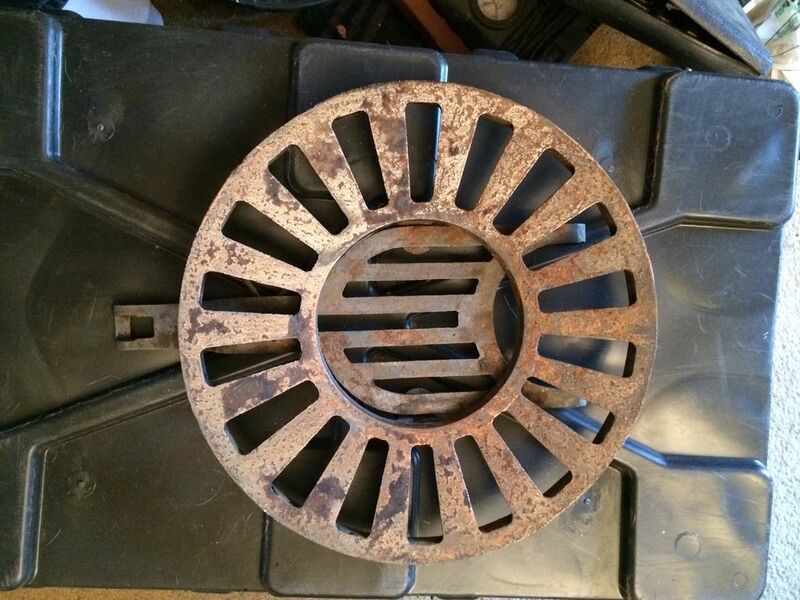 I found some junk at work to make me a grate for the weekend try out. So far so good. Here is my grate. It is some shelving that was tossed. Here is the set up as I intend to install it. Tin pan to catch wayward sparks, brick foundation, stove. I need to get another elbow and click together one more piece of pipe and I think we are golden. It's startin' to look like a real woodstove, now.....I like the paver & pan idea, too! Going to use a flint & steel for the christening burn? Man oh man, now that's coming right along Creek!! Can't wait to hear how the first burn goes. The other thing that came to mind....don't know if you're a coffee drinker or not, but one of those blue enameled coffee pots would be right at home sitting on the top of that stove, ready to refill your cups as you sit back and relax...inside the tent....in the warmth.....now that's gotta be a little like heaven right there!!!! I like the way you think Dan. Tea or beer for me but some decoration might be in order. As long as I don't burn it down I'm gonna be smiling..
Wolfy, I've done thought about the flint & steel for the burn off. I might video it. I got my other elbow, put 1 more piece of pipe together (have 4 assembled) and got my cap. Can't wait to burn it off in the morning and set the tent back up. I think the pipe will run from the side away from the tree. It has Boy Scout written right on the front of it! I like the fit of the tent inside the deck, also see some kind of awesome looking chair in the back. Never noticed those before. Happy hot tenting. I burned off the unit today and got it moved down to the tent. It was really wet so I actually got a fire burning then put the stove together and just put all the pipe on top so they could burn off. Party just getting started here. Didn't take long to get it going. Was smelling like hazardous waste at this point. Pouted over the empty deck. Took about an hour for the new to burn off. Got the tent set up in the mean time. Added a level of blocks to the base. Main reason was to get it up a little higher. Rugs weren't the size the guy said they were but I can deal with that. Got my pipe rigged up. Wired it to the tent pole. Seems quite stable. Used the thermal mat around the pipe at the flaps. Jury is still out on how this will become permenant. I think the tin pan will be a handy addition. Helps keeps things a little bit more tidy. Here she is in all here glory. Actually got Karen down there to sit a spell. I'm loving it. Still some tweaking to do. Also have to lay in some wood so I'm not collecting it as I go. Very fun and cozy. Here is a little video I shoot toward evening. That has got to be one cozy tent on a cold day! It's really neat to see it all come together. For some reason I thought it was going to be an ammo can stove build before I clicked the thread. That little.stove is neat! I bet it is plenty of heat no matter how cold it gets. I guess you are still going to cut a hole for the pipe in order to move the stove back into the tent farther and make it easier to get in and out the front? I'm still not sure how I'm going to handle the pipe yet. I did start a fire and fiddle with the flap closure some. I used some cord to extend the tie backs some. I wanted to kinda get a feel for the heat transfer off the pipe. The flaps were about 4 inches off the pipe I guess. Heat was not an issue it seemed. It was too warm to close the bottom but I think with care You could tighten the end of the tent pretty good without fear of burning it. The mat works good. Not too crazy about this writing on the inside if the tent. You can see better from this shot how the cord is used. If you wonder why the heck I'm doing this, I want to take this thing out for a real winter camp test. Probably not till next year though. What's wrong with you, creek......didn't you see the plainly posted warning? Seriously, though......I think you're on the right track with tying the flaps up the way you did. A more permanent workable solution will probably occur to you some evening as you sit there in the warm tent thinking it all over. In looking at the photos; what is holding up that pipe that is anchored to the tree and holding up the tent ridge? It looks like it attaches to the pipe but I don't see how the pipe is holding it up given the geometry. I think this is coming out really neat. The pipe is held up by a steel cable that is extended to an eye up in the tree Stan. I have no experience with a stove jack. I thought it pinched the folded door canvas. If you know the "bathtub" fold for a tarp tent floor corner, I think it's like that. I am pretty sure cutting isn't needed. I have it all cleaned up. I'll ship it out in a few minutes. fireboard just saying.anda small fire extingusher. it does look like fun though. Took everything back apart. Got the grate installed. Put the damper in. This is a happy stove. I had wanted to post earlier that one thing I had learned for sure is..... you need gloves to keep this holiday happy. This rascal gets hot. I got all my pipe screwed together and pounded the angles a little so they won't want to move. The grate and damper made the stove work a whole bunch better. Now if the weather will cool off a little so I could test it under cold conditions. I'm learning a lot as I use this shelter. Here's something I've been meaning to ask, but just kind of forgot about until I saw these last photos. Do you think that collar wrap would be sufficient insulation to prevent scorching the tent flaps if they were just closed in a normal fashion? You could probably test it out by building a really hot fire in the stove and just feeling the outside of the collar with your bare hands.........heck, you might not need to do anything else at all! We are on the same wave length wolfy. I had it fired pretty good the other night and with the tie back extensions got the flaps pretty close to the pipe and heat was not an issue. A cold day and a stack of knuckle sized wood will help tell the tale. I don't want to cut it any more than you guys want to see me do it...But it has to work and I am going to put this in the "real" woods.